The Tony Awards were held this week, which naturally has me thinking about show tunes. For example, dinner at Silver in Bethesda brings to mind “Getting to Know You” from The King and I. If you live in or around Bethesda, Silver is probably familiar to you. The restaurant sits on Woodmont Avenue, next to a parking garage and across from a new condo building. It’s a bustling area, and the construction is still in full swing. Restaurants are popping up all over, which is probably why there’s a campaign underway to introduce or reintroduce Silver to area diners. I was invited to a recent “Meet the Chef” event, where we had the opportunity to fully explore the menu offerings, both new and established. For those who don’t know about Silver, it’s part of the regional Silver Diner chain of restaurants. Silver is an upscale version, with an art deco interior that has more style than the faux retro Diner, and a menu that is decidedly more creative. Plus, there are cocktails. The first time I dined at Silver, the restaurant was relatively new. An enthusiastic server knelt down so that he was at eye level with my friend and me, and asked with great sincerity: “Have you been here before?” When we answered no, he responded: “You are in for a real treat.” He proceeded to detail the attributes of the cocktails and excitedly describe various dishes. I had a hard time keeping a straight face, his shtick and demeanor seeming out of place. 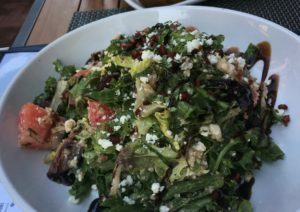 Despite our server’s theatrics, I enjoyed the food, and returned on subsequent occasions, most often for a salad before heading to a movie at Bethesda Row Cinema. We appreciate a chance to get to know more about Silver and its Executive Chef Ype Von Hengst, who is also a co-founder of Silver Diner. The restaurant partners with local farms and purveyors to deliver meals that are fresh and seasonal. Von Hengst recently won an episode of “Chopped” on the Food Network, which is an impressive addition to his bio. 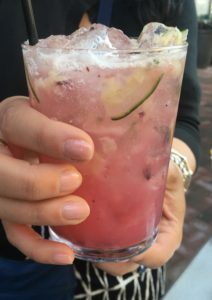 My evening commences with Silver Smash, a refreshing blend of Bacardi raspberry rum, ginger beer syrup, blueberries, and cucumber. It’s the perfect overture to a meal on this warm summer day. Chef Ype is showcasing a menu of summer specials. 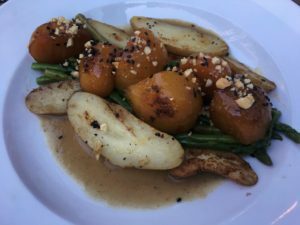 Miso glazed golden summer beets with fingerling potatoes and asparagus has an appealing zing. Watermelon – kumato tomato salad isn’t exactly a show stopper. The watermelon isn’t sweet enough (too soon) and I’m not on board with the pairing of watermelon and kalamata olives. A sprinkling of quinoa doesn’t add anything to the mix. A little editing, and an optional add-on of cinnamon chipotle shrimp, and I would sing a different tune. 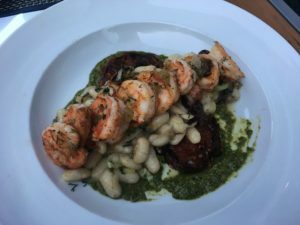 Carolina shrimp with white beans, slow roasted tomatoes, and pesto grabs my attention. Each ingredient complements the other, and the deft spicing makes the dish soar. 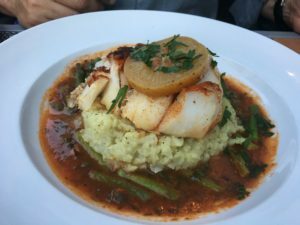 The Silver menu includes a variety of dishes labelled “Under 600 Calories.” My husband selects tomato caper cod with cinnamon chipotle spice, cauliflower mash, provencal sauce, and asparagus. Note that it’s the ingredients that appeal to him, rather than the calorie count. He has already enjoyed an excellent edamame and white bean hummus dip served with naan bread. The shrimp and cod dishes are both well-composed, amply portioned, and vibrantly flavored. My salad days at Silver are about to shift in a substantial way on future visits, particularly when I hear rave reviews from other diners about ahi tuna poke salad and the pickle fried chicken sandwich.